Kolkata, formerly Calcutta, is a vibrant city accented by remnants of it's colonial past. Victorian architecture adjacent to traditional Hindu temples shines light on the unique cosmopolitan vibe of India's third largest city. As with any great city, when the sun goes down the drinking holes fill up, from grimy dive bars to the posh nightclubs, the city on the Hooghly River has it all. 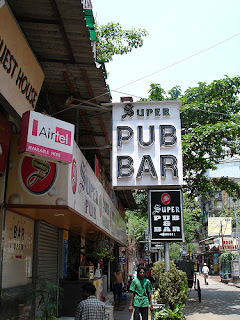 The area in which most budget traveller's will be staying has a range of cheap but no-frills bars. Located at the East end of Sudder Street. In case you weren't sure that a 'Pub' serves liquor the "(Bar)" makes it abundantly clear. Waiters dressed in bowties and vests serve up ice cold beer in a nice AC room with one large flatscreen TV. Not particularily "super" but close to the budget accommodation. Cheap beer makes it a great place to start the night. Located in the Lytton Hotel midway down Sudder Street. A small but stylish bar with red lighting highlights and several flatscreen TV's showcasing the latest cricket highlights. High end relative to the sudder street standard and somewhat pricey. Located midway along Sudder Street at the Fairlawn Hotel. Slightly overgrown garden bar gives one the feeling of being miles away from the city in a sub-tropical Jungle. A great place to start the night and an excellent place to meet other travellers and locals alike. Only serves Beer, no liquor. One of Kolkata's most expensive hotels, the Park Hotel on Park Street is an epicenter for nightlife in the city. A range of bars and nightclubs to suit anyone's needs as long as they're prepared to spend a bit of money. Multi-room restaurant/bar. The largest room features a live band on some nights of the week while the Ming room is reserved for those in search of a little quiet. Trincas Tavern is cheapest of the Park Hotel Complex for both food and drink. Calcutta's most rocking bar features cover bands every night of the week. Stylized with traditional English pub decor, one could truly feel that they have gone "someplace else". An upscale cafe serving overpriced "street food" also comes equipped with a full bar and a range of domestic and imported beers. 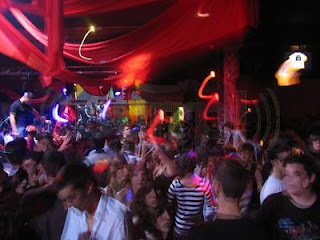 Reputed to be one of Kolkata's best nightclubs, Tantra is a large high ceilinged dance hall centered around a large square bar that serves overpriced drinks. A lounge area at one end with bean bag chairs and a dance floor at the other ensure comfort for both those who came to dance or simply to relax. An additional bar upstairs provides eagle-eye views of the bar and dancefloor below. Shimmering silver discs on the walls make this stylish downstairs dance club an attractive venue. Nice dancefloor with big projection screen. Unfortunately, most crowds head directly for Tantra leaving the dancefloor a somewhat sparse. Rival hotels to the Park Hotel are the Kenilworth an the Astor. Both have their own nightlife venue and both are located South of Park street on Shakespeare Street. Would feel just like an english pub were it not for the occasionsl hindi beats coming from the small, but lively, dancefloor. 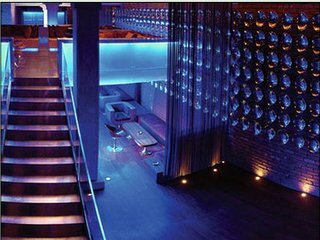 Another of Kolkata's finest nightclubs comes in the form of a smallish but comfortable nightclub. The decor reminds one of someone's warm yet very posh living room giving the club a great vibe akin to a raging house party. The recently developed suburb of Salt Lake has it's own happening scene. Clustered in 'Sector 5' bars and nightclubs cater to the many young professionals working in the IT industry. A favourite of young professionals, Shimmer fills up early as people make their way there as soon as the work day is done. Lots of T.V.s ensure that you're up to date with the latest cricket scores and the rowdy dancefloor provides poppy tunes to dance to.